I became a Life Coach because of Oprah. Yup, that's how much an influence she's been on my life. 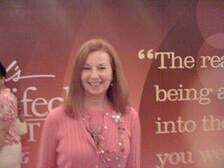 I first got fired up to become a coach, while watching Oprah do a series with Life Coach, Cheryl Richardson, twelve years ago. Now I'm training other folks who are equally fired up, to become coaches, themselves. Thank you, Oprah! LESSON 1: Know When to Break the Rules. Moments before leaving my house in Washington County, I called my friend, Career Coach, Joanne Waldman, PCC, for some last-minute directions to her house, more than an hour away. Joanne, who was accompanying me to Lifeclass, mentioned that the rules said we were supposed to bring small handbags, not gigant-o bags, like the one I was planning to bring (Oprah likes her audience to look great on camera, so wear bright colors and keep your little bag under your seat). LESSON 2: Set Your Intentions and Act Like Your Hair's On Fire. I called my sister, Becky, and asked her to bring my big bag with the tix and meet us halfway. It was crazy. There was no way we'd get there before the theater closed its doors for the taping, but we went for it. And you guessed it! Half the audience was carrying gigant-o handbags (see above pic) and nobody cared. So respect your limitations (mine is distractibility) and adjust the rules to fit you. And if you screw up (which you will), set strong intentions and act on them like your hair's on fire. 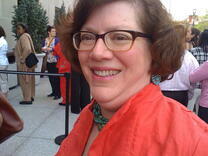 <===== Here's me in the lobby, just before the ushers threw us out, insisting we get to our seats. Yeah, we broke their rule to 'keep moving', so we could nab a couple of pics. After all, we were feeling pretty special for getting there faster than humanly possible. LESSON 3: Take a Chance on the Unknown. I had the option to enter the lottery for 4 different Lifeclass tapings, each with a different guest. Two were Deepak Chopra and Tony Robbins, heroes of mine. One for Iyanla Vanzant, who's great. And one for a guy I never heard of, Bishop T. D. Jakes. I really just wanted to see Oprah, so I took a chance on the new guy and he was absolutely awesome. I won't even try to tell you what he said; you have to SEE him. The show airs Monday, April 9th, 8ET/7CT. Bishop Jakes is all about Finding Your Purpose. LESSON 4: You're Here for a Reason. That was the key message of the show. You're here at this show for a reason (Joanne and I knew that. We were MEANT to be there, so we had to get there on time). Your life has a purpose and Oprah and Jakes taught us how to find it. Adversity doesn't stop you from achieving your purpose. In fact, Jakes' metaphor for purpose and adversity is an archer: If you're the arrow, and your life is the bow, then the farther the archer (adversity) pulls the arrow (you) back, the farther and stronger you'll go to reach your purpose (Joanne and I had just proven that on the way to the show). LESSON 5: Your life is a class. I was already familiar with most of the lessons they taught that day. After all, I've been a life-long personal development junkie. Oprah and Jakes just have an incredibly intense and wonderful way of teaching it all. They connect to the audience more profoundly and reach more people, as a result. They are more animated (that's why you have to SEE them). They're more entertaining. After all, they are masters of television. They are stars. But aren't you are star, also? Oprah thinks so. LESSON 6: It's what happens off-the-record that really inspires. 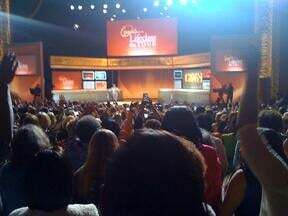 At the end of the show, as we were about to leave our seats, Oprah came back out, not for the television cameras, but just for us. She talked about how her purpose was to use television to help people have better lives. That she was always asking God to use her. And she had focused on how to use the Oprah show to serve her purpose, not have the show use her. And that's her big vision for OWN TV. That she has made mistakes with the network and was digging out of a hole (the papers say she just laid off 20% of her staff). She asked for our help to spread the word, so our culture has at least one television channel that uplifts, instead of just pandering to our lowest common interests. Hmmm, could it be that adversity will help her arrow soar even farther and stronger? School of Coaching Mastery has never really been about life coach certification. It's about the mastery coaches achieve on the way to coach certification. But what's the purpose of coaching mastery? Coaching mastery is about helping people (coaching clients) learn the life lessons they need faster and more deeply, so they can create better lives and reach the highest, fullest expression of their beings. Period. I've talked for years about the importance for coaches, of becoming Servant Entrepreneurs and I just had the honor of seeing the Ultimate Servant Entrepreneur. Oprah is a Servant Star. Not because she's about being a star, it's because she's about revealing the star in you and asking you to use it to serve. In what ways might you already be a Servant Star? How do other Servant Stars light you up? How do you light people up? What do you need in order to use your life to serve your purpose? Do you know what your purpose is? How is adversity sending you even farther and stronger toward your purpose? Did Coaching Go Mainstream Without You? I've been at odds with all the experts on this one for years and I read it again in Andrea Lee's book, Multiple Streams of Coaching Income,recently (which I recommend, btw). Everybody who knows anything about coaching knows that coaching hasn't gone mainstream, yet, but when it does, it'll be really BIG. Have you heard that one? Guess what? Coaching already went mainstream! How do I know? For starters, I first heard about coaching on the Oprah show five years ago. Actually, I had heard of it previously, but it didn't sink in until Oprah did an entire series with Cheryl Richardson (every Tuesday, I think.) At the time, Oprah was the #1 TV show in the world (I think it still is, but I haven't looked that up). They even watch it in Saudi Arabia! That's as mainstream as it gets (and that was five years ago). I remember telling Thomas this in an R&D class, when he asked "When do you think coaching will go mainstream?" "Coaching is already mainstream, now", I said. (I could tell he didn't believe me.) Who was I to tell Thomas anything about coaching? I was just green enough not to know any better! Sometimes it takes a neophite to notice something the experts are missing. And every year that goes by, I get more right about this one. In 2005, coaches aren't just guests on other people's TV shows, now they have their own shows. Rhonda Britton even has two shows on different continents! And have you noticed how often coaching gets joked about in advertising, TV and movies? And did you know that there's an indie film out there called, Life Coach, the Movie? Did you know that thePurpose Driven Life, a run away best seller in the US, is a coaching book written by an evangelical minister? I think coaches are resistant to this idea, because they've bought into the notion that when coaching goes mainstream, everyone will have a coach. Then, it'll be easy to get clients, right? I think coach training schools further this notion. They train coaches. The coaches can't find clients. The coaches say, "Hey, what happened?" and the training schools say, "Just wait, when coaching goes mainstream, it'll be easy." What if coaching went mainstream without you and you're still waiting for it to get easy? So where are my clients then, you say? They're all around you. People want coaching. They want better lives, better careers, you name it! And some coaches are making money fast by offering people what they want. What's my point, here? My point is that professionals (not just coaches) stop themselves from being successful, because they get too rigid an idea of how success is going to look. They keep waiting for success, their way, to show up, when success a thousand possible ways is going wanting. I learned this as a personal trainer. Personal training is about 10 years ahead of coaching. I remember when nobody knew what it was. Some people still don't. But it hit the mainstream in the 90's. I was able to ride that wave, because I had learned that in fitness, you can't sell people what you think they need, you can only sell them what they want. I remember sitting in the back of a Pilates studio in Manhattan, where I was picking up and extra certification. My classmates were bemoaning the above distinction like they were doomed to failure, because of it. Then I shared the secret: "Once you've got them, you can educate them." Little lightbulbs went on all over the room! My personal training clients come to me with very specific goals. They want to fit into the jeans they wore in college, for instance. Or they want to look like they did at eighteen. I don't lie to them. I tell them I can't turn them into eighteen year olds, but they can look great at 50. They're willing to accept that as a goal. Funny thing, though. They almost always say later, "I came because I wanted to look better, but the real reward is that I feel so much better." And they stay with me. I've had one client for fifteen years! How does this translate into coaching? I'm not suggesting you pull a bait and switch. Don't promise to double their income and expect them to be satisfied with less stress. (That could happen, but don't plan on it.) Do find out what they want and what format they want it in. Will they buy a book, a motivational CD? Will they join a group that meets in your living room every week? Will they take a work-out class where the instructor slips in a little coaching? Will they take a series of classes that includes a coaching gym? Once you've got them you can educate them. What else can you do for them that they don't know about, yet? Do you know that chasing after dreams is almost never as fulfilling as living your values? People who haven't been coached, yet, don't (usually). Let them begin to learn that, while they're experiencing you in some other format. Offer to take them even further with it. Maybe that'll lead to one-to-one coaching. Maybe to another book. Who knows? One thing is for sure. With seven billion people on the planet, you don't have time to coach them all one-to-one. Especially now that coaching has gone mainstream!